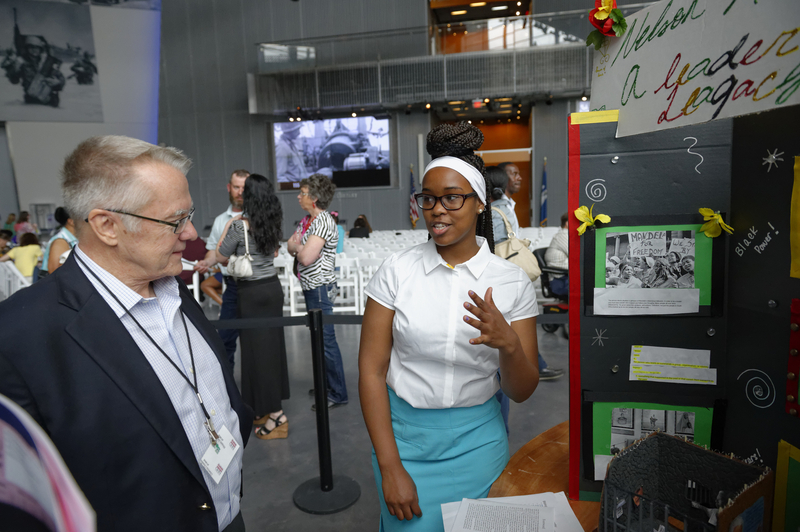 The National WWII Museum is looking for teachers and professors, historians, undergraduates and graduate students, museum professionals or anyone with a love of history and community to help judge this year’s National History Day contests! National History Day is a year-long historical research contest for middle and high school students. Each year, students from across Louisiana create documentaries, research papers, performances, websites or exhibits based upon the annual contest theme. A major benefit to students participating in National History Day besides the fun and excitement of creating an original work is the outside review of that work by volunteer judges, who donate their time to review students’ projects, make suggestions for improvement and determine the entries that will advance to the next round of competition. Judging is an integral part of the National History Day process. The feedback that students receive is critical to their growth as young researchers. Most of the students will not pursue history as their college major or career choice, however, the skills that the students hone in creating their National History Day projects will apply to any college or career path that they choose. The National WWII Museum is always looking for volunteers who possess both foundational knowledge of history and great communication skills to serve as judges. No prior experience is necessary besides an enthusiasm and interest in encouraging middle and high school students in their research and work! Judges are needed for Regional Contests in New Orleans, Baton Rouge, Lafayette, Shreveport and Monroe as well as the State Contest in New Orleans which determines which students go on to represent Louisiana at the national competition in Washington D.C.. The dates for all Regional as well as the State Contest can be found below along with the sign-up form to serve as a National History Day judge. The National History Day program is exciting and fun, however, the benefits for participation for students working with primary sources and performing original research are very real and can earn them rewards both inside and outside the classroom such as scholarship moneys, special prizes and even paid educational travel. That said, none of this would be possible without the generous help and support of our volunteer contest judges. Sign up now to judge National History Day! Find out more about Louisiana’s National History Day program. For other questions on how to get involved with National History Day, contact the Museum’s Student Program’ Coordinator, Collin Makamson @ 504-528-1944 ext. 304 or historyday@nationalww2museum.org. Follow responses to this entry through the RSS 2.0 feed. Both comments and pings are currently closed.